The Summer Exhibition, now in its 248th year, is the world’s largest exhibition, and has taken place annually since 1769. Every year thousands of entrants submit works of art and media in all mediums including; painting, sculpture, photography, printmaking, architecture and film. The event is a great platform for emerging artists, household names and successful artists to come together. Entries to the Exhibition are narrowed down, by a team of Royal Academicians, to 1,000 works for the final show. Federico’s ‘Woodstream’ has been selected amongst 12,000 submissions for the Exhibition in the section of Architecture. Woodstream is a three-dimensional structure that expresses the complexity of surfaces and volumes using a six-axes machining processes. 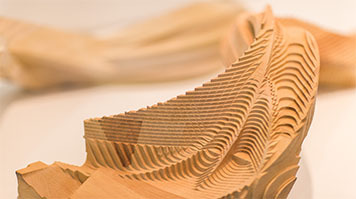 The sculpture in scale 1:10 represents the conceptual model of the sculpture developed in collaboration with SCM Group, using complex milling algorithms where the design meets digital fabrication to replace completely hand crafting techniques. Federico said: “I’m extremely happy to be a part of the Royal Academy Summer Exhibition, especially with a design that reflects the research and projects currently underway in the Digital Architecture and Robotic Lab at London South Bank University. “The project was developed using advanced milling techniques with the aim of producing different geometry conditions. The result is Woodstream, a sinuous fluid sculpture where you can read the toolpath from the digital manufacturing process. Find out more about the School of Built Environment and Architecture.